GCG Publishing’s experience with various binding styles, coupled with our state of the art, in-house digital printing equipment, will provide the fast, flexible publishing solution you’ve been looking for. 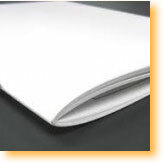 Perfect binding uses a strong, flexible adhesive to attach a heavier paper cover to the spine of the assembled pages. Paperback novels are common examples of perfect binding. 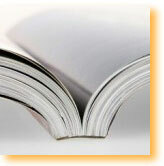 Case binding is also known as hard cover binding. Pages of the book are bound at the spine, and hard covers (cloth, vinyl, or leather cases) are attached. 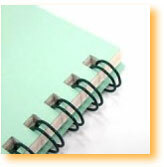 Plastic spiral binding uses plastic coils spiraled through holes on the bound edge of the book. 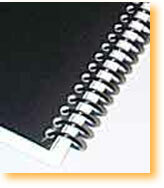 Spiral bound books lie flat when open and are useful for manuals, cookbooks, journals or workbooks. Wire-O binding is very similar to the plastic spiral. The Wire-O technique winds a circular double-wire strip through holes along the bound edge. This style of binding lays flat when opened. 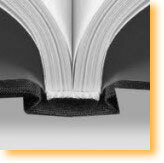 Saddle stitch binding secures printed, folded, and nested pages with stitches (staples) down the middle of the fold (the spine).